Melbourne & Olympic Parks (M&OP) has today announced the completion of Rod Laver Arena’s eastern-facing entrance and new food and beverage facilities. Rod Laver Arena, the heart and centre court of the Australian Open, has debuted its brand-new three level “pod-style” guest entrance – which is set to welcome more than 700,000 tennis fans to the Australian Open tournament commencing 14 January 2019. 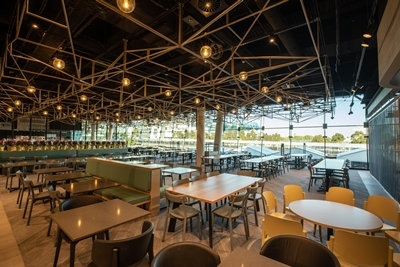 Rod Laver Arena’s new dining offerings will be enjoyed by the tournament’s players in January, before this space officially opens to the public from Keith Urban on 5 February 2019. 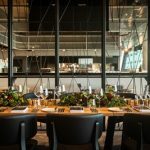 While playing host to the nation’s most famous events, Rod Laver Arena also counts a variety of business events and function spaces within its precinct – catering to both large-scale conferences and smaller corporate functions – and, its location is within walking distance of Melbourne’s vibrant CBD. “Rod Laver Arena is an iconic Melbourne venue – home to some of Australia’s favourite sporting and entertainment events. We’re incredibly excited to unveil the grand new entry with exciting new bars and dining options, which will give guests even more choice when they come to visit us,” says Lara Burnes, General Manager – Premier Events & Experiences, Melbourne & Olympic Parks. The Arena will continue its development into 2019, completing the extensive upgrade of the seating bowl and the addition of more exciting food and drink options. Bookings Business Events in the Arena’s new restaurants and bars are now open with service on event days set to commence from February 2019. The seating bowl and northern food and beverage spaces will be completed later in 2019. Expressions of interest in visiting M&OP should be directed to Lara Burnes at lburnes@mopt.vic.gov.au. For more details on the redevelopment visit melbournepark.com.au.